If you’re like one third to one half of the U.S. population who consider themselves introverted, discussing professional networking events—whether career fairs, meet and greet hours held at conferences, or even happy hour with coworkers or potential employers—induces slightly sweaty palms. Networking events are often referred to as “shmoozy events” because of the negative connotations associated with networking. Done the right way, professional networking doesn’t have to be socially awkward; you don’t have to push yourself on others or worry about saying exactly the right thing at just the right time in order to land a job or get a raise. It is important to remember, though, that first impressions are made within the first seven seconds of meeting someone. That’s a powerful statistic and one that sticks; the primacy effect (the tendency to remember what we notice first, whether it proves accurate or not) has lasting impact on our brains. This brief video provides college students and recent grads with simple, easy tips to implement at networking events. These tips are especially helpful if you’re a networking newbie, about to graduate and begin networking as part of your efforts to find your first full-time job. 1. Eat prior to arrival. While light to heavy hors d’oeuvres are often served at most networking events, it’s never a good idea to arrive on an empty stomach. Be sure that the snack you choose isn’t heavy on onions or garlic-laden, though; you don’t want to carry offensive odors to your networking event. Arriving without an empty stomach will help you feel calm and mentally alert. You will be more able to focus on potential employers, build connections, and enjoy yourself if you’re not hungry. Dress codes are all over the place for networking events. Play it safe and stay conservative, wearing business attire. You can’t really go wrong with a well-fitting business suit. If you want to dress it up, wear a brighter shirt or tie than you might normally wear, but don’t go crazy. Networking events aren’t the time to pull out your new sequined dress or to dress down either, thinking it’s more about socializing. Remember, you’re ultimately there to build professional connections; these connections might assist you in your job or internship search now or later. Smiling is the easiest way to let people know you’re approachable. If you’re introverted, intimidated, or simply not excited about the event, smiling is a great “fake it til you make it” strategy for making the most of networking events. You’re already there, so why not have a good time? Keep one hand free at all times. If you must eat a quick snack, put down your drink in order to eat. Best case scenario, though, you will watch this video and read this article before you begin attending networking events, and you can adhere to tip #1 (eat prior to arrival). When you eat prior to arrival, you’ll find yourself able to more easily shake hands, exchange business cards, and carry a bottle of water because not carrying a plate of food. 5. Prepare an elevator pitch. At professional networking events, you’re most likely going to introduce yourself and be asked the question, “So what do you do?” repeatedly. An elevator pitch answers this question and then some. Your elevator pitch—if pitched properly, that is—communicates who you are (in terms of education and work history), what you do (related to jobs and careers), what you want to do, and why. It’s important that potential future employers understand that you have specific goals—that’s an admirable quality, one most employers seek in candidates. Your elevator pitch should last no longer than 30 seconds (stay focused) and should end with a question. That question shouldn’t be, “How can you help me?” Even though we’re all seeking help from others in the job search process, the question should be focused on your new contact. Is your contact the CEO of a company? Ask him how he began his career in the business world. Ending with a question lets the other person know that you are not self-centered; networking is a two-way street, and getting to know your connections is vital to successful networking. If your new contacts or potential employers want to get to know you further after you give your spiel, they’ll follow up with questions. On the front end, keep it short and sweet. 6. Talk less; listen more. As the saying goes, you have two ears and one mouth for a reason. As Dale Carnegie said in How to Win Friends and Influence People, “Talk to someone about themselves, and they’ll listen for hours.” General managers consistently rank listening as one of the top skills in the workplace, too. It matters, and people value you when you do it well. 7. Give and receive contact information. Prepare business cards before beginning your job search or internship search. You can purchase very affordable business cards online from a variety of vendors or use a business card template available for free online. You definitely don’t want to arrive at networking events empty-handed, though. When someone asks for your business card, it’s proper etiquette to ask for theirs as well (and vice versa). Don’t make it your goal, though, to procure as many business cards at networking events as possible. There’s no point in this behavior. Unless you actually established an initial connection with a real person at a networking event, a business card is just a piece of paper. If possible, wear pants or a skirt with pockets or carry a small purse. You need a place to keep the business cards you gather. You might think of the whole “exchanging business cards” process as old-fashioned, but it’s still being done, and if you don’t bring cards to networking events, you’re the one who’ll be left out. 8. Call them by name. 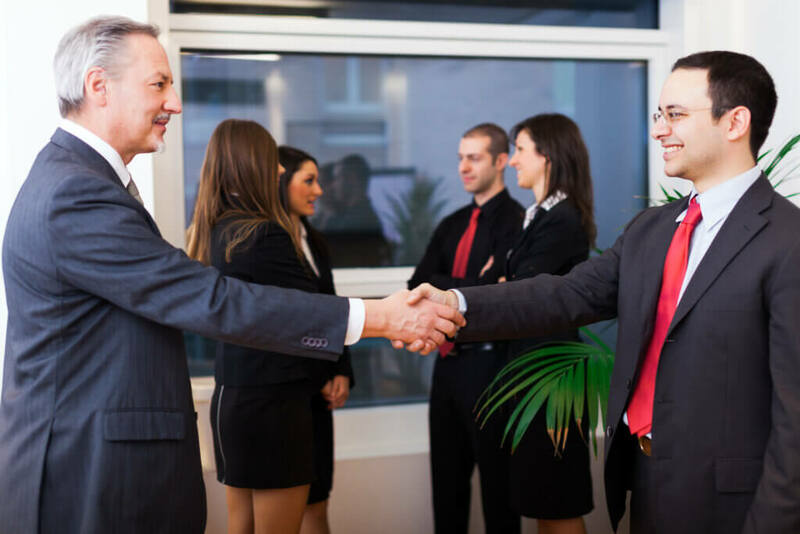 When introduced to someone new at a professional networking event, call that person by name throughout the event. Not only will this help you remember the person’s name later, but it will also make that person feel recognized and provide a personal touch (give that person warm fuzzies), and there’s nothing wrong with that. You don’t need to come home after networking events and immediately search for your new contacts on LinkedIn or Twitter, sending invitations like a stalker. Connecting on social media is part of networking, but following up has many layers. It’s not a one-size-fits-all strategy. Think carefully about each of your brand new contacts and how you might best connect with them individually before sending a mass email to 20 potential employers with your resume, references, and electronic portfolio attached. Remember, networking—whether online or offline—is about building connections which hopefully last for a lifetime. These relationships are just like the other relationships you invest in; relationships require work, and relationships are about give and take. Those same principles apply to professional networking. For more Tuesday Tips, follow College Recruiter’s blog and follow us on YouTube, Facebook, LinkedIn, and Twitter. Stick with College Recruiter as we help you connect the dots on your path to career success and introduce you to great jobs, internships, and careers. Begin your search and apply today!